are the largest bodies of land on the Earth. Look at a globe. Whatever is blue is water. Most of the rest is land: the continents. There are seven continents. From biggest to smallest, they are Asia (29.9 percent of the land area), Africa (20.6 percent), North America (14.8 percent), South America (12 percent), Antarctica (10.5 percent), Europe (7 percent), and Australia (5.2 percent). Collectively, these continental areas occupy about 57,100,000 square miles (148,000,000 square kilometers) with a mean height above sea level of about 2,760 feet (840 meters). 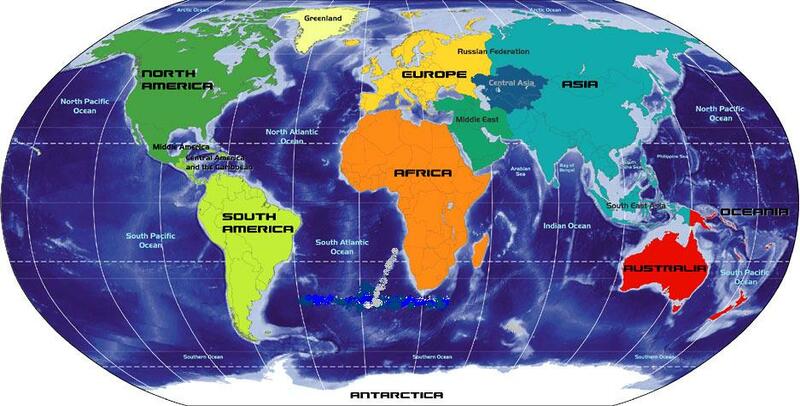 Some continents, such as Australia and Antarctica, are completely surrounded by water. And some continents are joined together, as Asia and Europe are. Continents are physical bodies, defined by their shape, size, and location. They have mountains, rivers, deserts, forests, and other physical features. But humans have divided them into political groups, called “countries” or “nations.” Large continents, such as Asia, may include both very large countries, such as China, and very small countries, such as Nepal. Australia, the smallest continent, is also itself a country-one of the world’s largest. North America contains three large countries-Canada, the United States, and Mexico-and a few small countries in a region known as Central America. Europe, on the other hand, is the world’s second smallest continent but has about 50 countries. Africa, the second largest continent, is believed to be where the very first humans appeared. The continent of Antarctica is all by itself down at the South Pole. It is rocky and is covered by thick ice that never melts. Only a few plants and animals can be found along its seacoasts. Earth scientists believe that the continents began forming billions of years ago. Lighter parts of Earth’s molten core separated from heavier parts and rose to the top. As they cooled off and became solid, the land that would become the continents formed. The continents were probably joined together at first and then drifted apart. One theory supposes that there were once two “supercontinents”: Gondwanaland in the south and Laurasia in the north. Lowest recorded temperature: Vostok Base, Antarctica -128°F.